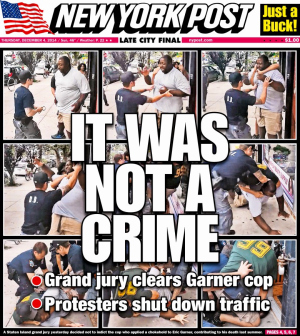 The jury is in, and not unexpected though still as senseless a ruling as the broad-daylight murder of Eric Garner in New York City, AND Michael Brown in small town Ferguson, Missouri AND Rumain Brisbon in Phoenix, Arizona, AND 12-year old Tamir Rice (his toy gun “looked” like the real thing to Cleveland, Ohio Police Officer, Timothy Loehman who had been adjudged “unfit for police service in a small town police work in 2012) AND ON, AND ON AND ON. This happened in broad daylight in America of the 21st Century. [Photo: N.Y. Post].